Writer Patrick Langley reports on a four-day field trip across the granite landscapes of Cornwall and Devon. 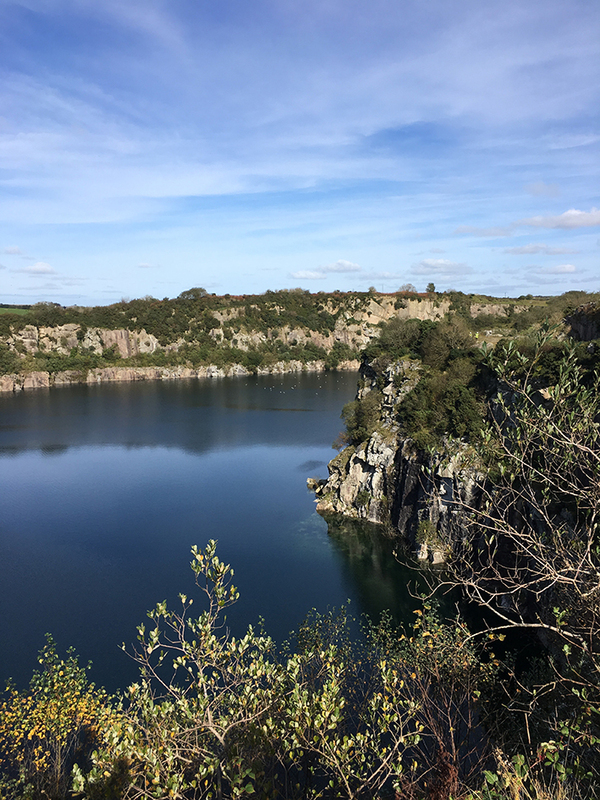 One blustery afternoon in early October 2017, on the sloped path in Trenoweth Quarry, Penryn, the geologist Ruth Siddall was admiring some granite. The slab was one of countless such odds and off-cuts stacked along the pathways of the quarry, the air of which echoed with the rhythmical clink of masons whacking chisels in the open-air sheds nearby, ‘rough-punching’ the surfaces of rectangular quoins to prepare them for use in construction. In the midst of this abundance of stone, I was puzzled by Ruth’s interest in this particular specimen. My untrained eye saw an unremarkable, dull grey sheet, indistinguishable from those around it. Camera in hand, Ruth asked the artist and mason David Paton to pour some water across the stone. He unscrewed the canteen, let the liquid fall – and at once the stone was transformed. What was flat and inert a heartbeat ago was now vivid and mesmerising, a blizzard of light and shade. Lichen gleamed like silver. Feldspar held the immodest creaminess of pork fat. Deeper in the stone, flecks of mica acquired a winking brightness that brought the stone to life where the sunshine touched it. It was clear to me, in that instant, that granite was more responsive – more ‘alive’ – than I had credited it with being. Led by David Paton, In Search of a White Cross was a four-day field trip across the granite landscapes of Cornwall. I joined a group of artists, geologists, writers, filmmakers and students setting off from a bunkhouse near Helston to cut a rough line heading northeast across the peninsula. 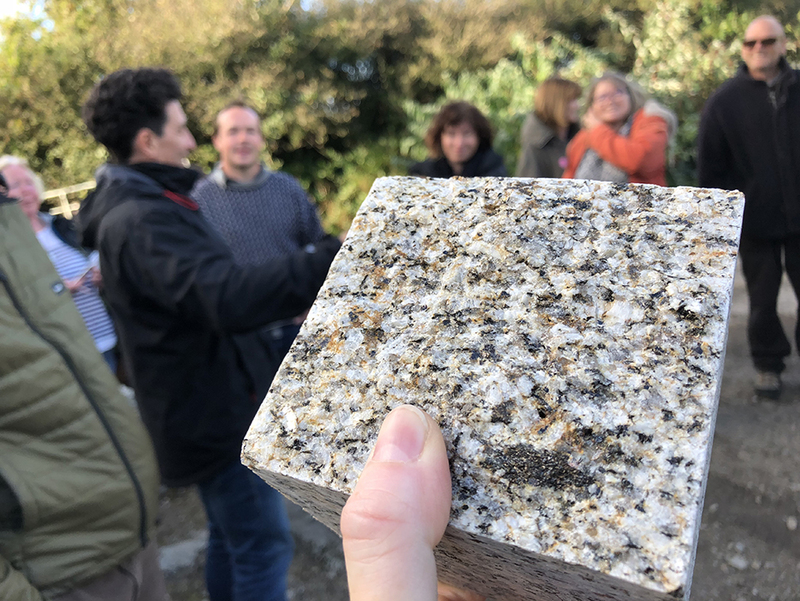 Together we visited quarries, castles, climbing walls, kitchens, and farms, tracing the life cycle of granite, from extraction to construction. In chilly, cavernous sheds at De Lank, quarrymen controlled enormous, rotating saws. Drooling with pumped water – for drowning the sparks, I assumed – the saws sliced lumps of granite into usable sheets. In the mighty corridors of Castle Drogo, we saw a staggering example of how the stone is used in building. 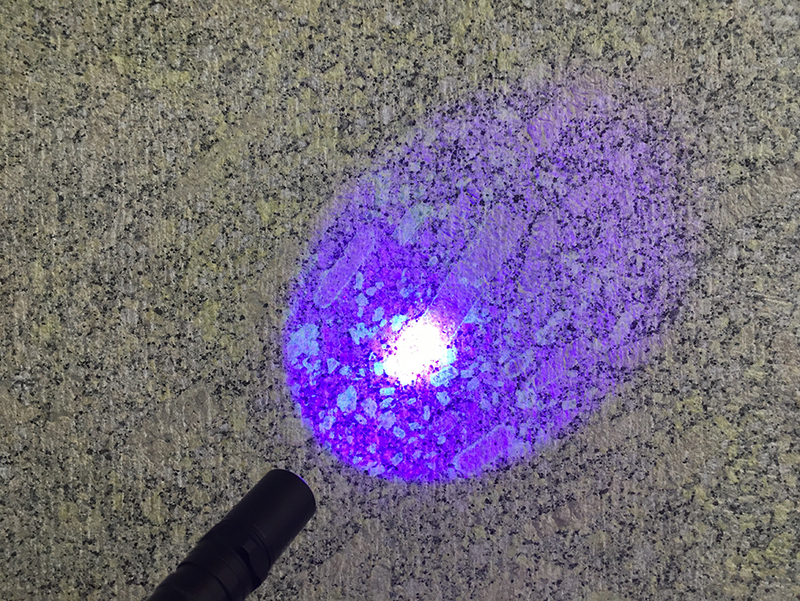 But even here, the stone held secrets: a blacklight (UV) torch, held by the geologist Hazel Gibson, revealed patterns of light-sensitive minerals inscribed like invisible ink on the matt-grey stone. On a long enough time scale, even granite castles dissolve, and in the decommissioned quarries at Kerris, Tregarden, and Hantergantic, we saw how nature had reclaimed the quarried land in the wake of industrial decline. 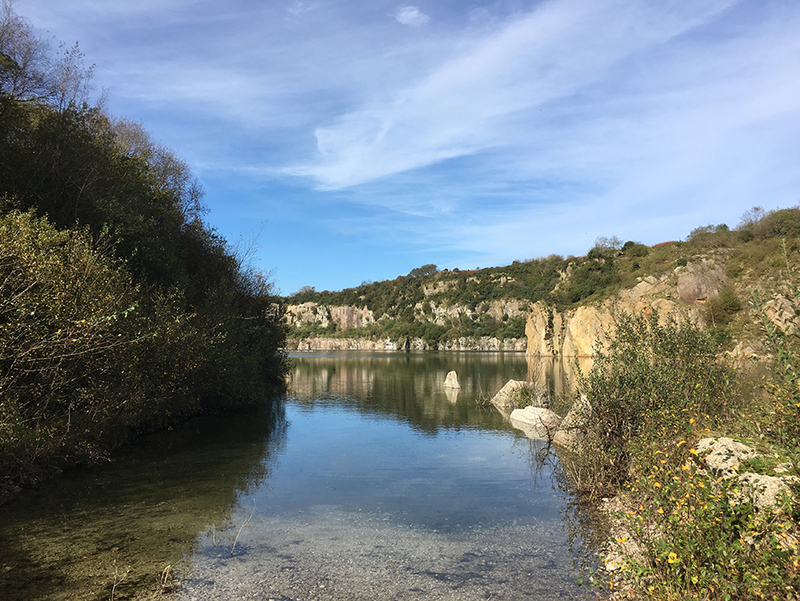 Flooded with groundwater and runoff from the surrounding fields, these quarries had evolved into accidental nature reserves. The blue-black waters of the placid lakes were strewn with Canadian Geese, and protected from the surrounding hills by mobs of lanky weeds. The ‘white cross’ of our field trip’s title existed somewhere between fact and myth, stone and story. David first heard about it while training as a mason. According to the legend, an apprentice who locates a white cross – a rare X-shaped formation caused by a perpendicular conjunction of feldspars – will be enlightened in the ways of the masons, blessed with special knowledge of his craft. 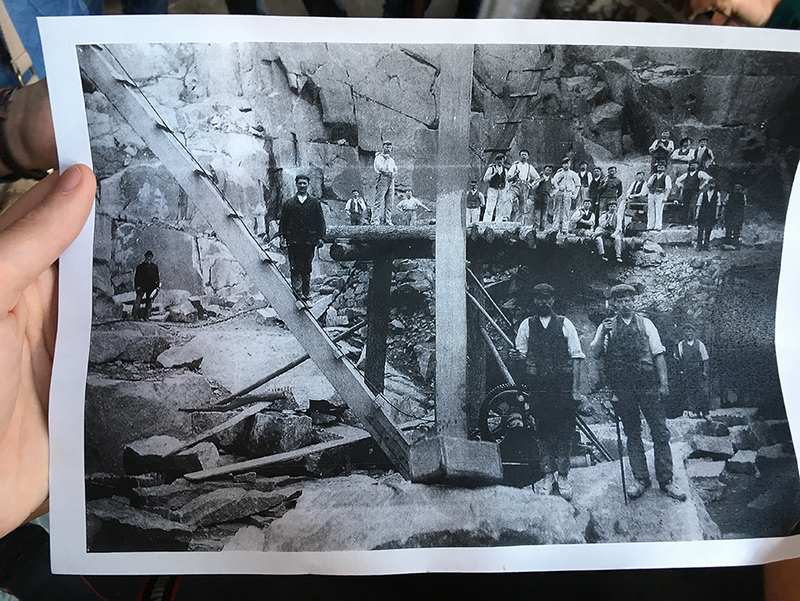 The book Cornish Granite: Its History, Legends and Modern Uses, first published in 1910, includes the testimony of a mason, called Uncle Willy, who remarks: ‘now and again, though seen rarely of mortal eye, the white makes a perfect cross in the stone. But he who finds the White Cross is lucky from that hour, and many things — ’tis said — are plain to his eyes that others cannot see’. I didn’t expect us to find one. I assumed the white cross was a kind of grail, a distant, mystical symbol. As it turned out, we found white crosses almost immediately, in Trenoweth, the second quarry we visited, not long after Ruth and David had officiated at that revelatory marriage of granite and water. Here were two small, wonky examples of the fabled cross, tucked away in the thick grain of a hand-carved sink filled with rainwater. As discoveries go, this felt amusingly premature. Certainly, their discovery failed to invest us with secret knowledge. All the same, their presence was a positive omen: we were on the right track. For the painter and writer Ithell Colquhoun, the interaction between culture and landscape, matter and myth, constitutes the ‘psychic life of the land’. In her travelogue The Living Stones (1957), she declares, in unambiguous terms, that ‘the life of a region depends ultimately on its geologic substratum’. Granite, for Colquhoun, was symbolic of her rootedness and connection to Cornwall, where she lived for the latter decades of her life. Shortly after the Second World War, Colquhoun moved from London to Lamorna, a village on the Penwith peninsula. When she first set eyes on her cottage, it was a wreck. Weed-infested, tumbledown, its ‘mould-grown’ windows tainted the air of the single-room space with a greenish light that made her think of aquariums. It had no running water, let alone electricity. It was hemmed in by streams and tangled wilderness. It was, in other words, perfect. Colquhoun purchased it at once. In The Living Stones, Colquhoun describes Lamorna as a landscape of magical flux and fluidity, in which the atmosphere works like a spell, altering all it touches. The Gulf Stream, she writes, tempers Cornwall’s ‘bitter air’, and sets a tempo for the ‘molecular dance’ of its skies. In the remoteness of Lamorna, in that isolated shell of a dwelling, Colquhoun found the Western equivalent of Assam, the ‘place of deluge’ in which she was born in 1906. In Cornwall, distant, dreamlike memories and Celtic myth mixed with more immediate observations of nature, spinning a web of deep connection to the Cornubian Batholith, the enormous granite substrate that comprises the foundation of Cornwall. In her 1939 essay ‘A Sketch of the Past’, Virginia Woolf wrote with a more shared, if more sceptical, sensitivity to the mysteries of stone. Cornwall’s granite hills, scattered with Neolithic standing stones, altars, and tombs, were for Woolf elusive entities, ‘at once real and imaginary’. Woolf and Colquhoun were onto something. Rationally, of course, I knew that granite was insentient: a mute, brute, and voiceless substance utterly devoid of life. But as the field trip progressed, I found it increasingly hard to escape the sense that granite was aware of our presence, as conscious of us as we were of it. The hills had eyes; the earth was watching; great beasts slumbered in the stone. Descending curving paths into the rough-hewn amphitheatres, we witnessed sheer displays of geological history. Hundreds of millions of years of pressure and change had been exposed, in an instant, by sudden ruptures of ‘black powder’ — a low strength explosive. These quarries were giant, gaping portals into realms of inhuman substance, windows affording immediate views of the menacing perfection of stone. The Renaissance occultist John Dee believed that pieces of polished obsidian – he called them ‘seeing stones’ – allowed him to communicate with angels. 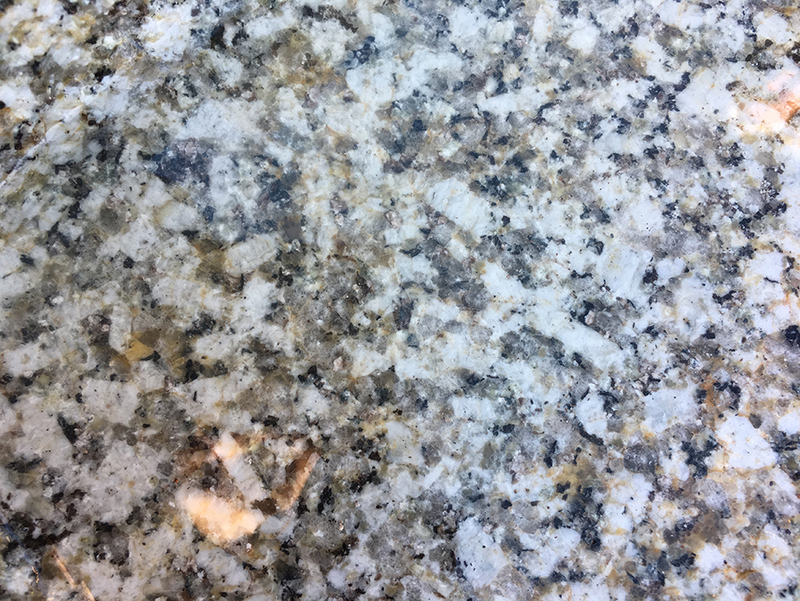 I wondered if granite was both at once: blunt, weighty, functional stuff, and a point of magical contact with nonhuman life. Such a whimsical, aestheticised view would be harder to sustain if I worked in a quarry. Quarrymen work at the whim of explosive blasts, falling rocks, accidents – and each other. At Hantergantic, in the lashing rain, Ernie Hillson reminisced about the bare knuckle fights that broke out daily, sometimes hourly, on the derelict ground where we stood. He chuckled as he said it, nodding softly, nostalgic. Workers would punch and kick and beat each other, he said, viciously and for almost no reason. They wound each other up until repeated petty irritations – knocking off each other’s caps, borrowing tools without returning them – escalated into full-blown brawls. Then, next day, swollen and aching with cuts that hadn’t yet healed, the men would greet each other with a stiff nod, as though nothing had happened. Ernie’s account of quarry life held an aura of anarchic and attritional masculinity; but more so, the arbitrary, hardscrabble pugilism struck me as a peculiar form of group therapy. If you lived in the shadows of sheer granite, vast chunks of which could topple onto you while you worked, if you had watched your friends get crushed to death by a falling rock-crane, if earth-shaking explosions were a commonplace fact of your job – surely these stresses would seek release, as surely as magma forces its way through the earth’s fissured crust? Violence was a quick, effective form of catharsis. Perhaps all encounters with stone produce more than is bargained for, and affect us in ways we don’t immediately realise. In his 1968 essay ‘A Note on Metal’, the poet J. H. Prynne argues that, during the Stone Age, ‘weight was the most specific carrier for the inheritance of power, and weight was and is a mixed condition, related locally to exertion.’ No matter how many technologies expedite the process – chisels, ‘black powder’, diggers, cranes – quarrying would not exist without the localised exertion of bodies, almost all of them, historically, male. Hands, heart, muscles and lungs are all involved in the act of extraction. 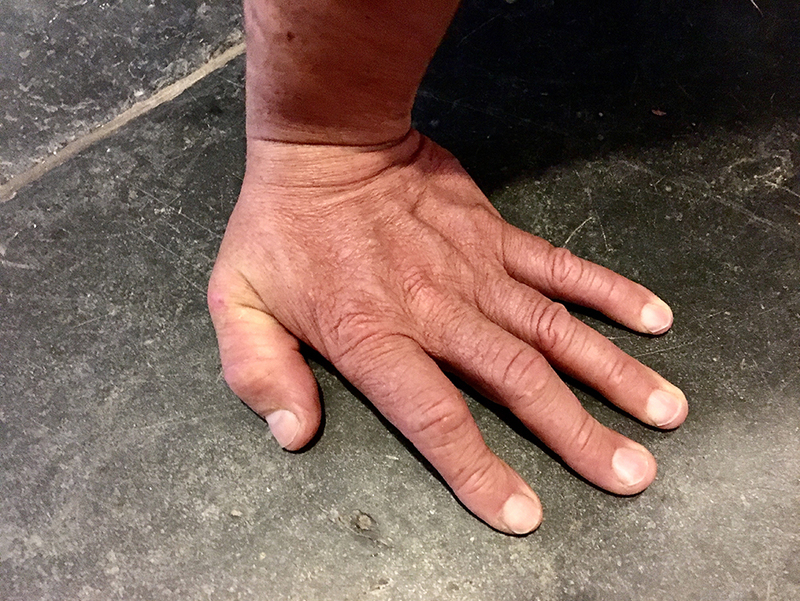 At the Beach Head Bunkhouse near Wadebridge, while we waited for a tiny stove to heat the chilly room in the absence of a functioning boiler, I photographed David’s outstretched hand as he sat on the flagstone. Earlier in the trip, he had told us how often the hammer will miss an apprentice’s chisel, and be cushioned by tender fingers instead of striking the head of the tool. By dint of error, repetition, and injury, stone instils a fluency of gesture: eventually, intention gives way to instinct. Carving is a reciprocal process, and people who alter granite are altered in return. Dust builds up in the lungs, causing silicosis. Open quarries exhale radon gas into the atmosphere. Yet granite also impresses itself upon human bodies in less tangible ways: as muscle memory, tradition, and inherited knowledge. Among the many remarkable passages in The Living Stones are Colquhoun’s descriptions of Cornish weather. ‘A strange variety of haze,’ she writes, ‘is that which is sometimes brought by an east wind, normally a harbinger of a knife-blade clarity – a black wind, as they call it, remembering a far-off Celtic windlore in which each quarter had its hue.’ I knew exactly what she meant – I had encountered it several times during In Search of a White Cross. At several points on our journey, moisture occulted the landscape. Rolling fogs and drifting vapours hid the woods and towns from view, and moments later the shrouds were lifted. We passed steep fields dotted with outcrops of granite, bulbous and rotund as droppings left by a giant rabbit. Something paradoxical was taking place around us. The weather, in which physical things appeared to melt into depthless light, appearing and disappearing at the whim of aimless mist, emphasised the solidity of the granite it worked to obscure. 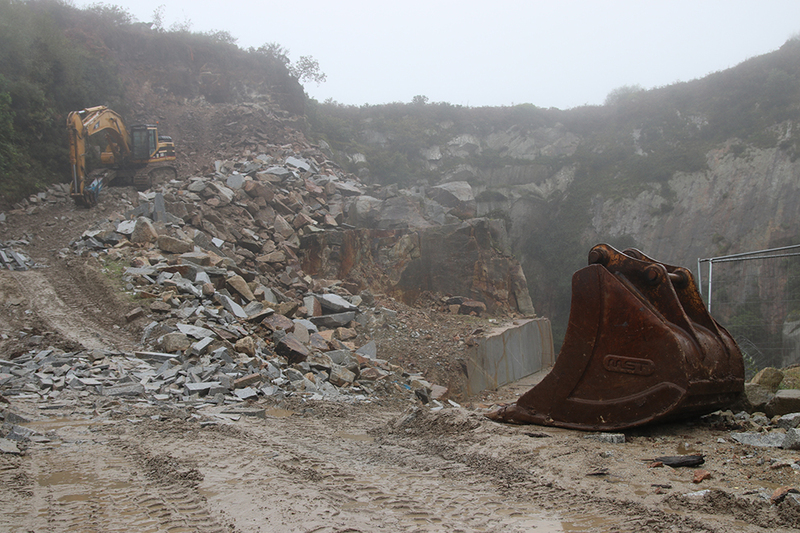 When we stopped at De Lank quarry, I plucked a chunk of granite from the ground of the car park. The stone was glossed with a wetness that made its hard edges quiver with rims of reflected light. Later that day, the geologist Beth Simons informed me that the modest lump of granite I had pocketed in the car park was at least 270 million years old. This is the minimum amount of time it takes for magma to pierce a weak point in the bottom of the earth’s crust, melt and mingle with the rock it finds there, cool and crystallise, and force its way through the upper side of the crust, forming mountain ranges, substrata, schists, boulders, hills, and so on. Any encounter with granite must reckon with its age. In the eighteenth century, this had a profoundly destabilising effect on religious accounts of the earth’s creation. (The Bible claims that the earth is 6,000 years old. Geology tells us that it is closer to 4.55 billion.) I felt the rock’s sandpapery roughness under my fingertips, turned it in the light to watch the crystalline minerals flash. It was difficult to reconcile the sensitivity of touch with the awareness that the stone is almost incomprehensibly ancient. In The Writing of Stones (1971), an ecstatic treatise on the aesthetic potential of stones, Roger Caillois describes life as ‘a complex dampness, destined to an intricate future and charged with secret virtues’, a ‘kind of precarious slime’, a ‘turbulent, spasmodic sap […] breaking with mineral perpetuity and boldly exchanging it for the doubtful privilege of being able to tremble, decay, and multiply’. Stone, with its aura of intractable stillness, offers a contrast to the mortal quickness of animal being. But this dichotomy, however eloquent, is perhaps reductive. It was during Ruth’s Siddall’s explanation of ‘the seven crystal systems’, that I realised something that should have been obvious from the start: stone is in constant motion. Ruth was explaining how the crystals form as their mineral liquids cool, interlocking, extending, enmeshing. I pictured a cyclical process, laid out like an illustration from a Dorling Kindersley guide to geology. Stone melts and morphs, erodes and drifts, crumbles and reforms. Magma tides entice tectonic plates into earth-quaking conflict. Elsewhere they wrench them apart, spilling guts of lava over the ocean floor, or spurting jets of arterial orange from volatile volcanoes. 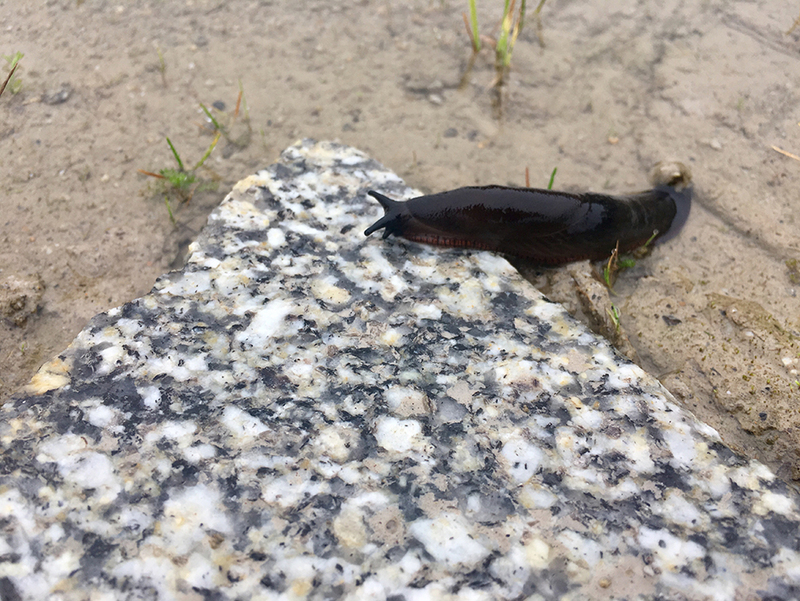 Stone crumbles to sediment, which layers in rocks, which slide, sink, melt afresh as tectonic pressures drown them in the bowels of the earth: change after change after change. Stone is locked into a restless, relentless cycle. It just happens to turn so slowly that humans, in the main, tend not to notice. At Kerris, there weren’t any pitiful birds or sword-wielding, pagan demigods. But there was a sense, in my mind at least, that nature moved here at a ponderous, spellbound pace; that the air was charged or enchanted with dreamlike possibilities. In fact, when the branches retreated, the path opened up, and we finally saw the quarry itself, I felt I had been there already. As a kid, I sometimes dreamt about dark, unknowable bodies of water, wells, ponds, and pools into which I might fall and forget myself. Kerris was just like I’d seen in those dreams. Flooded with blackish water, it was surrounded by lichen-clad trees, moss-softened heaps of unused granite, rust-brown ferns, matted grasses, and wild flowers. Nearby, a crowd of pale green, delicate lily pads floated on the water’s surface. Their sunken stems hinted at inhuman secrets, alive and unknowable, just below the limit of our awareness. Awoken by the violence of quarrying, those depth-dwelling forces, whatever they were, had been concealed afresh, I felt, by the slumbering water. The quarry was profoundly silent. Except, that is, for the hushed, excited murmurs of the group – I seem to remember we spoke in soft voices, as though we had entered a church – and the crackle of rain on the leaves. Looking at the water, entranced by its aura of mystery, I pictured a great beast slumbering in its depths. Earlier that day, Geoffrey had shown us a remarkable stone used in the wall of a barn. He reckoned the stone was ancient, even Neolithic. Farmers recycled chunks of granite wherever they found them, and it was likely that this particular stone had formed a part of several buildings over the centuries. It was carved with a spiral pattern. The grooves felt soft and worn under my fingers, and its surface was blotched – as all still things eventually are, in this part of the world – with lichen. Ithell Colquhoun would, I think, have loved this incorporation of an ancient, Celtic artifact into the living fabric of a Cornish farm. Yet the spiral kneeler stone was eloquent of the future as much as the past. In his 1987 book Time’s Arrow, Time’s Cycle, Steven Jay Gould describes how the emergence of geology in the eighteenth century was triggered, in part, by the following recognition: ‘granite is an igneous rock, representing a restorative force of uplift (so that the earth may cycle endlessly, rather than eroding once into ruin)’. 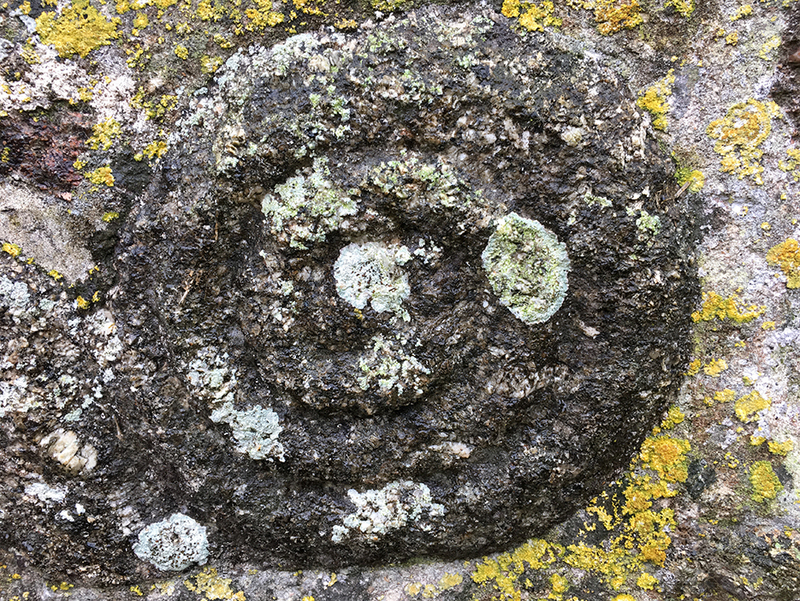 Time is not a straight line, the stone suggests, but a spiral. If granite lends Cornwall its bedrock, it also offers a model of cyclical transformation and restoration: of continuity through change. Text © Patrick Langley and CAST (Cornubian Arts & Science Trust), 2018. In Search of a White Cross, a field trip organised and led by Dr David Paton, was commissioned as part of the Groundwork programme 2016-18, supported by Arts Council England. The field trip received funding from Feast and support-in-kind from Falmouth University’s School of Film and Television, the National Trust and Cornwall College. Patrick Langley is a writer based in London. He is an editor at Art Agenda and a contributing editor at The White Review. His first novel, Arkady, was published by Fitzcarraldo Editions in March 2018.